All fish produce ammonia as a toxic biological waste. Additionally, rotting food or other biotic material also produces ammonia. If ammonia builds up in an aquarium, it can rapidly poison fish by irritating and even damaging vulnerable tissues like the gills. 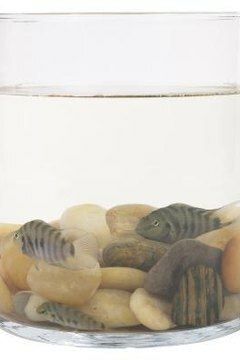 You can take several steps to decrease the amount of ammonia in an aquarium and give your fish an opportunity to heal. You must address the underlying issue that caused the elevated levels of ammonia, or any corrective action will be a stopgap measure at best. In a healthy aquarium, beneficial bacteria break down ammonia into less toxic substances. However, excessive feeding, adding too many fish too quickly or overcrowding the aquarium can all promote excessive ammonia levels. When feeding, never feed more than the fish can eat in about half a minute. Also, remove dead fish, plants and other biological mater as soon as you notice it, since rotting organic matter produces ammonia. Lastly, carefully plan and stock your aquarium to avoid overcrowding. If you take these steps, you are less likely to see ammonia levels spike. A water change is the only direct, short-term way to correct ammonia. It does not correct the underlying issue but removes some of the ammonia and dilutes any that remains. Make sure that you treat your tap water first with a dechlorinator that can also break down chloramine. Some municipalities use a form of chlorine that can convert to chloramine, an ammonia compound, when mixed with some dechlorinators. The bottle will tell you if a given dechlorinator can handle chloramine—and nowadays most do. In addition to changing the water, you can take a few other steps that will lower ammonia levels. First, stop feeding your fish. Fish can survive for a few days without food, and their bodies will produce less ammonia if you skip feeding. Additionally, make sure every filter is functioning, and nothing is blocked or stopped. Adding aeration, in the form of either water movement from pumps or air movement from air stones or air pumps, will correct the issue. Resume feeding when ammonia levels are around 0 parts per million. Any detectable amount of ammonia is potentially harmful. Ammonia issues tend to show up when you're first establishing your aquarium. New aquariums go through a process called cycling, when colonies of bacteria that eat fish waste and related nitrogen compounds establish themselves. Traditionally, hobbyists cycle their tanks by adding a few fish at a time, waiting until ammonia—and shortly after that, a related compound called nitrite—drops to zero, then adding a few more fish until capacity is reached. Using a new method, you can use unscented household ammonia to cycle the tank before you get your fish. With this method, you add enough ammonia to reach 4 or 5 parts per million a day. When the aquarium can, by itself, turn this level of ammonia to 0 parts per million of ammonia and nitrite, you can add all your fish at once. The one downside to this method is that you have to let your aquarium sit for two to four weeks before adding fish.